The space between a single tooth and the surrounding gums is called the gingival sulcus. When pockets grow in size, bacteria infect healthy tissue and break it down. Eventually, a pocket can grow large enough to make the gums detach from the tooth, jeopardizing its health and future. Periodontal disease occurs when bacteria infect the roots and structures of the teeth and gums. The infection grows over time, causing loose, broken, and missing teeth. Not just a problem in the mouth, periodontal disease can result in systemic illness when bacteria seep into the bloodstream, affecting the major organs. While we can treat mild periodontal disease, it remains critical to keep up with teeth brushing at home several times a week. We also check your pet’s teeth and gums during their regular wellness examination 1-2 times a year. If we notice excessive tartar growth, bleeding gums, inflammation, or other problems, we may pursue a dental cleaning under anesthesia and order a full set of digital radiographs. Since periodontal disease causes the most damage beneath the gum line, x-rays are critical to get while your pet is anesthetized for their cleaning, exam, or procedure. We will clean and polish the teeth, remove any signs of infection, and provide instructions for at home pet dental care. 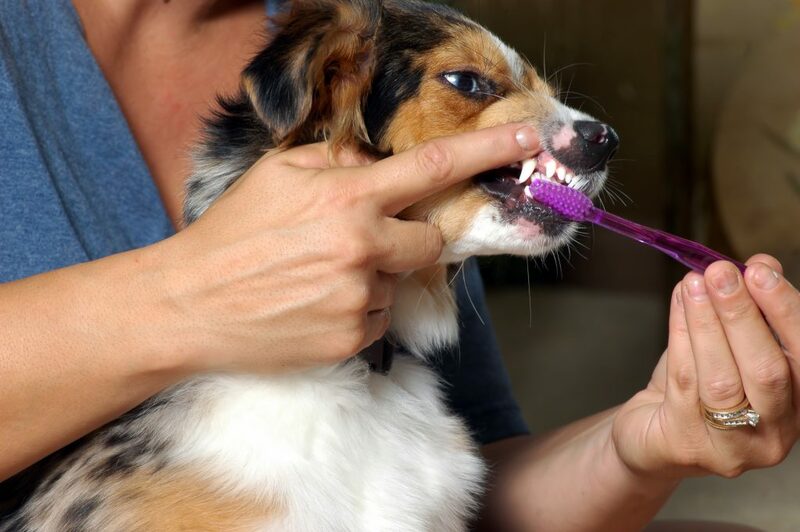 Whether it’s brushing, dental chews, or a special diet (or a combination of all three), we’re committed to keeping pet dental care a top priority. You can count on us to evaluate your pet’s dental needs. If you’re not on top of your pet’s dental care game yet, you can be with a bit of patience, practice, and dedication. Please let us know if you have any questions or concerns. Our veterinarians and staff are always here for you and your pet!